Vintage Outdoor is an exquisite, breathable and versatile paint developed for painting exterior furniture and walls, metal fencing, pvc surface and even glass. 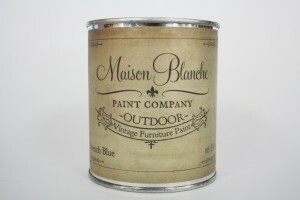 Maison Blanche Paint Company’s Vintage Outdoor formula imparts the same chalky vintage finish that our original vintage paint affords, but has built in UV filters and an intelligent moisture control membrane making it very well suited for the exterior walls and woodwork of your home. Vintage Outdoor has excellent breathability and moisture control, making it superb for painting in damp area such as bathrooms and kitchens.